Roulette is probably the most easily recognisable and beginner friendly game you will find in any casino. The simplicity of roulette compared to other casino games is very attractive to newcomers in a casino. It is no wonder why so many UK online casinos have a version of roulette that you can play and hopefully win some money on. Playing online roulette is just as easy as playing in any physical casino. You have 3 main elements to the game: The wheel, the table, and the ball. The wheel is divided into 37 slots numbered from 0-36 (American roulette has an extra number, giving them an extra house edge). There are 18 black numbers, 18 red, and the number zero is green. For every round of roulette, the wheel is spun by the dealer, then the ball is spun in the opposite direction. The ball will spin around until it eventually lands on a single number, this is the winning number of the round. The table is where you place your bets. The table has spaces for each of the 37 numbers, as well as other columns for you to place your bets. Placing chips on single numbers is self-explanatory. You place your bet on a number and, if it comes up, you win money back at a rate of 35 to 1. So if you place £1 worth of chips on 13 and the ball lands on 13, you win £36. You can also place your chips in between numbers, splitting the odds respectively, for example, putting your bet between 13 and 14 will give you a payout of 17 to 1. Red/Black, Odd/Even, High/Low (1-18, 18-36): These are all 1 to 1 odds, you bet £1 and you win £2. Dozens, Columns: These are all 2 to 1 odds. With a bet on 1st dozen, you will win if the ball lands between 1 and 12, 2nd dozen for between 13 and 24, 3rd dozen for between 25 and 36. There are also columns going along the side of the table putting the numbers into different groups of 12. You will not win with these outside bets if the ball lands on zero. 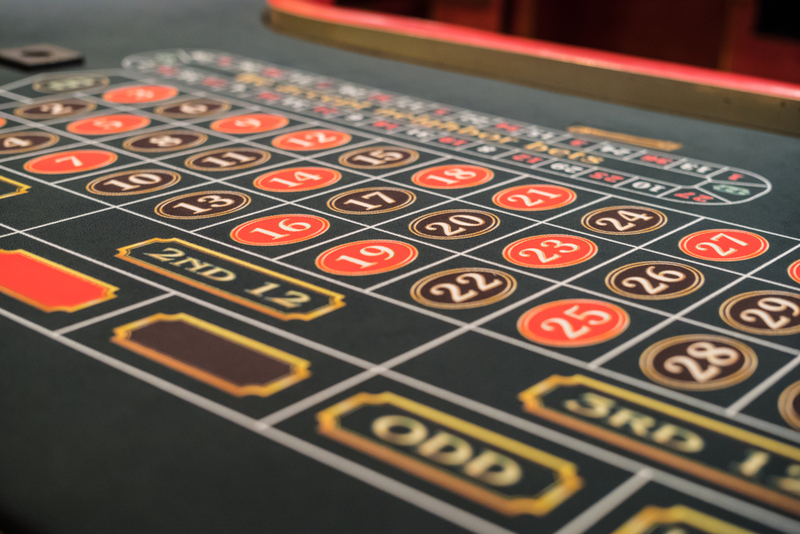 Some roulette tables will have minimum bets, so you may have to bet at least £1 on a single number or at least £5 on an outside bet. It’s wise to be aware of these limits and choose tables within your budget. Most tables will also have maximum bets. You can place as many bets as you please for every spin, some people will place a lot of single bets at once, this will increase their odds of winning but also reduce their profit as they will also be spending more on their bet. Look for European roulette wherever you can as American roulette has a double zero number on their tables which give them an added house edge. There are many people that play that have their own online roulette strategies. Some have their own “Lucky” numbers that they keep betting on an hope they turn up a few times in a row. Others will watch the board for a while and observe the “Hot” and “Cold” numbers and bet accordingly. Hot numbers are numbers that have come up frequently over the past 100 spins, where cold numbers are those that haven’t come up at all or have come up rarely. A common strategy is to place incremental bets. For example, you choose to bet only on red. You start off with £5, if you don’t win then you double your bet to £10 and continue until the ball lands on red. While the odds are in your favour that it will eventually land on red, you probably need a large amount of playing money to follow this strategy as you may have to double up a few times before winning. The number one strategy for roulette is to only bet what you can afford.